Do you plan on growing your own shrooms? Our spore syringes will work well for you! If you have a lot of experience growing magic mushrooms, then these syringes are perfect. The goal of using a spore syringe is very simple: you use it to inject the shroom spores into the growing dishes. Our syringes come with the spores already inside. If you are not an experienced user, you might be better off with one of our complete grow kits. 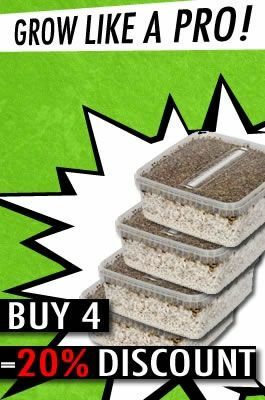 These contain all the equipment you need for growing shrooms, including instructions. You can get to work right away! Choose what you feel works best for you and read below for more about our different options. Our extensive selection boasts all different kinds of spore syringes, so allow us to tell you a bit more about them. They contain sterile water with hydrated spores. You can opt for the PF Classic spore syringe. This is the original Psilocybe Fanaticus type. This species grows quickly and produces short, thick mushrooms. This type is also well known for its preference for BRF: brown rice flour and vermiculite. Another popular spore syringe is the Koh Samui. This type is resistant to infection and gets thick, but not as tall. This species is well suited to beginners. If you are working with spore syringes for the first time, we recommend that you order this one. Ordering at Avalon Magic Plants is quick and easy. We don’t charge shipping costs for orders over €50 either. You save up points for every order you make. As you earn points, you earn discounts and can even order free products later on. You don’t have to choose spore syringes to reap the rewards. This applies to all the products in our web shop. If you have any questions about the use and effects of our products, you can always contact us.